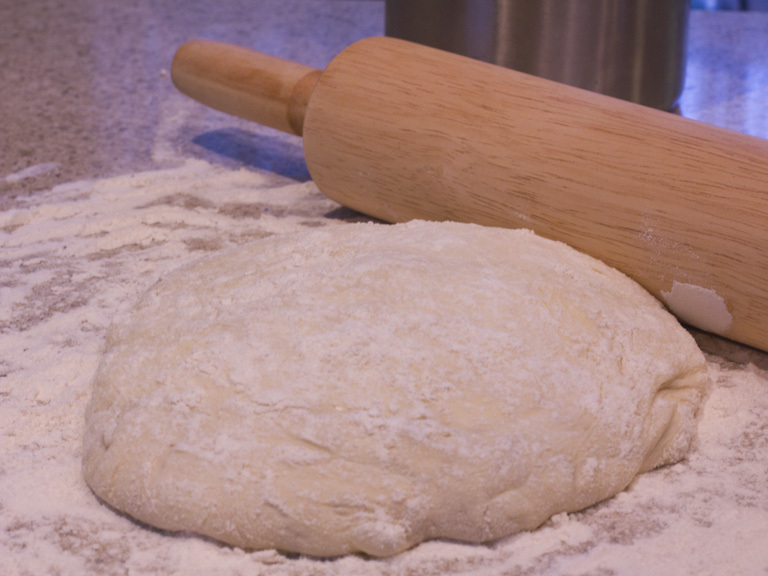 Homemade pizza is just about one of the best things out there to make. It’s really not that hard to make, but with a little attention to detail and the correct balance of quality and quantity of ingredients, you can really make some spectacular pizzas in the comfort of your own home. This particular pizza is my most favorite and I always get requests to make it. The pizza’s origin was from a similar pizza I had three years ago in a restaurant in Sonoma, California that just blew me away. It was so fresh and so tasty that I had to replicate it. The recipe that follows is from my many test runs to perfect this pizza. Go ahead and try it…you won’t be disappointed. 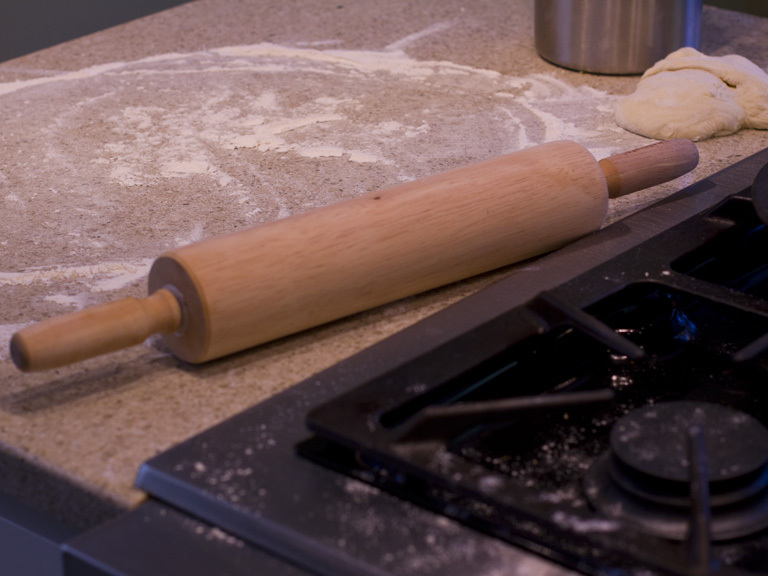 Roll dough out to a nice, round pizza shape and place on pan. The aerated pizza pans work great for this to give the pizza a nice, crisp crust. Place pizza crusts in oven and allow to cook, until just barely starting to brown, about 8 minutes. This is an important step to ensure that the pizza crust is nice and crisp and not flimsy in the end. Remove from oven and set aside. 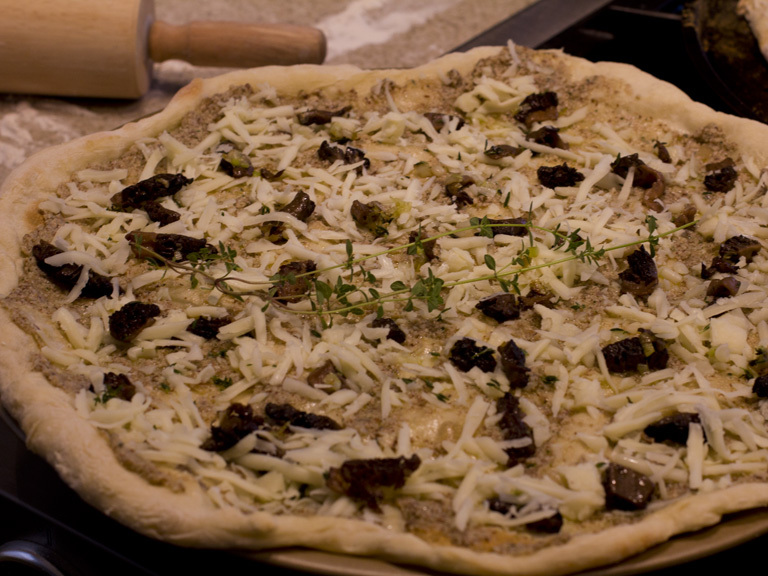 Sprinkle grated Italian cheeses evenly over the slightly cooked crust, not piling to thickly; just enough to cover. (Note: I have experimented with brushing the cooked crusts lightly with olive oil, and although it adds a nice flavor, it makes the pizza a bit to greasy) Next, place torn pieces of sliced prosciutto and crumbled goat cheese on the pizzas. Sprinkle with a little salt and pepper. Place pizzas in hot oven and bake for 8-10 minutes until cheese is bubbly and just starting to brown on the edges. Remove pizza and cut into slices. Top with arugula and serve. Mike and I ate at Lovely’s Fifty-Fifty a few weeks ago. It’s wood-fired pizza Nirvana on Mississippi. This post was not intended to be a restaurant review (so please excuse my moments of schizophrenia), but the fact that I had been dreaming about copycatting their fungal masterpiece should be review enough. (And you have not lived until you’ve had their homemade salted caramel ice cream). Since Mike cringes at the sight and smell of mushrooms, I decided to indulge myself when he headed out of town on a guys’ fishing trip. “Monkey See, Monkey Do” is the highly technical kitchen term being portrayed this week. In this particular case, the monkey saw and ate the dish in question but did not see the making of it. This is where imagination and creativity come into play. My mom has always referred to this as “by guess and by gosh.” I looked up the description of the pizza from Lovely’s website, formulated my own ideas about what should go into the pizza, and jotted them down on a list. I was hoping this would serve to keep me on task when I arrived at the uber exciting PSU Farmer’s market. Surprisingly, it did help rein me in. I left with only 4 things that weren’t on my list. And I intended to use the gourmet garlic onions on the pizza. I’d never heard of these spring delights before and couldn’t resist trying them. So where is the inspirational picture of my farmer’s market booty? Do you even need to ask? Mike was out of town and I was the sole photographer for this gourmet experience. There are many confusing-looking buttons on our fancy camera, but I swear that I didn’t hit the trash can button. The pictures I took of the fresh produce must’ve vanished to the same place that gobbles up socks from the laundry. I pulled the bag of dough out of the fridge and read the instructions. “Take pizza dough out of bag, flour, and let rest for 20 minutes.” I’m really not sure why it needed to rest when it hadn’t done anything yet, but I decided to follow instructions for once. While the dough was resting, I got busy with the pizza sauce. I’m pretty sure Lovely’s pizza sauce was just a light coating of olive oil, but I had already decided on an “enhancement.” I simply had to have a mushroom sauce base for my mushroom pizza. Those of you who know my food preferences should not be surprised that I decided to augment the Lovely’s-inspired pizza with even more mushroomy goodness. Sautee the shitakes and shallots in Grapeseed Oil (healthier for sautéing than olive oil) for 4-6 minutes on Med-High heat. Add the Garlic and Thyme and cook for another 1-2 minutes (avoid burning the garlic). Add sautéed mixture to a food processor and add more grapeseed oil. Salt and pepper to taste. Puree. Mix in the grated truffle. 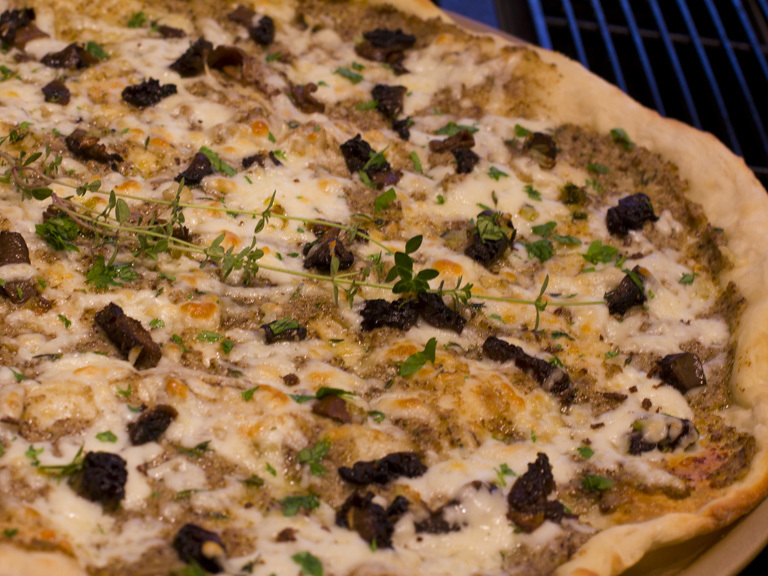 Voila, your mushroom sauce base is ready! Back to the pizza dough. Mike always handled the pizza crust on our pizza nights so I wasn’t fully aware how sporting the task really is. I would just have to wrestle the pizza dough monster myself. I started trying to roll it out but it stretched right back like a rubber band. So I tried picking it up by the top edge and letting gravity stretch it. Stretch, rotate, stretch, rotate. My meager success somehow led to images of spinning, flipping, and twirling overhead. These were visions of pizza Olympics and I had just barely joined the farm league. (I experience similar visions of grandeur when I watch Wimbledon and then head out for a Sunday tennis match at the park). Things were getting messy. If you want to get a sense of my cooking style, you should really check out this youtube video. Some might liken me to a female version of the Swedish chef (as opposed to Mike’s Iron Chef-like style). I finally managed to stretch 2/3 of the bag of dough (Mike can do the same with ½ a bag) out over one of our specialty pizza pans. We like the aerated pizza pans. They’re no substitute for wood-fired ovens but they help crisp up crusts pretty nicely. I put the crust in the oven for about 5 or so minutes at 450 degrees until it began to brown just a bit. Keep an eye on the crust while it’s cooking. 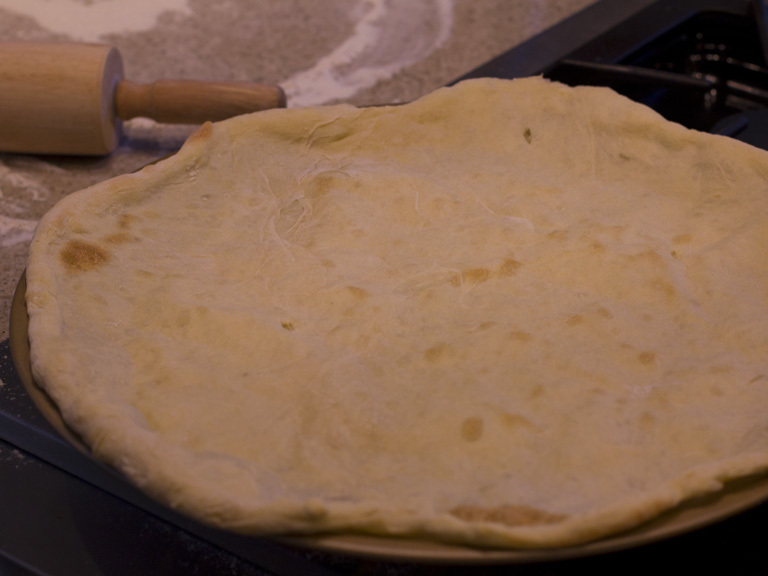 If the crust starts to puff up like a parachute, poke it with a sharp object to deflate it. I sautéed the mushrooms and gourmet garlic onions in Grapeseed oil over Med-High heat. I then added the garlic and thyme after 4-6 minutes. I cooked for another 2+ minutes (stop before the garlic burns). Do-Over Tip: I think it’s important to highlight do-over tips. If I had a do-over, I would double the amount of morel mushrooms and cut them slightly larger, but I am a mushroom fiend so look at the pictures and use your own judgment. Mushrooms always cook down much more than I anticipate and the morel mushroom is an especially tricky little devil. It looks so burly that I couldn’t fathom it shrinking while cooking. I was wrong. The morel cooks down just as much as any other mushroom. I spread the mushroom pizza sauce over the crust just like I would a tomato-based sauce. I added most of the cheese, arranged the morel mushroom sauté mixture, and then sprinkled the remaining cheese over top. I then baked for another 8-12 minutes at 450 (until cheese melted and started to brown). I drizzled the truffle oil to taste (I tend to be heavy-handed) and sprinkled a decorative dose of parsley over top. You might want to add a sprig of thyme for flair. The pizza smelled rich and delicious. (Mike would’ve used a different descriptor). On many occasions I’ve declared fungus to be my friend and this night was no exception. This monkey ended the night with a chick flick, satiated taste buds, and a full belly.